An automatic transmission has a lot of moving parts – all bathed in Automatic Transmission Fluid (ATF) to keep things running smoothly. 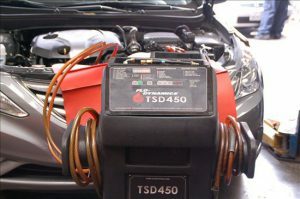 ATF, like all auto fluids, can break down over time because of the high heat. As the fluid fails, your transmission works harder and hotter and you may end up with an expensive repair. We have a specialised machine that flushes your transmission to remove all the old oil and gets it ready for the new oil. Included in the service is a new transmission filter and pan gasket. Servicing your transmission is key to preventing expensive gearbox failures in your vehicle.